Sean Karns characterizes the metallic scent of pennies in the first of five sections that comprise Jar of Pennies: “The year my mother worked / the slaughterhouse, / she came home smelling of blood: a jar of pennies smell” (“Jar of Pennies”). These themes waft through the rest of the collection. The scent of iron is the scent of blood—familial blood, the blood of domestic and national violence, the blood of death. And yet, a jar of pennies is a symbol of childhood dreams and determination, “I listened to her sobs; I rattled my jar” (”Jar of Pennies II”). For all their small spending power, pennies somehow retain the strength of childhood imagination and the potential of inexperience as a son grapples with suffering. So, too, does Karns’s poetry function, as both an unavoidable odor of open cuts and a careful collecting of slivers of precious moments. Karns succeeds at the alchemical process of distilling the self out of memory, letting readers step into these experiences. The young American son of the Midwest is witness to the violence endemic in the lives of his parents—unemployment, divorce, lying, abuse, the suffering of slaughterhouses, and broken dreams. Along with the self of his childhood, Karns evokes for readers the self of a nation with an ideal of peace as well as the self divided, caught in the turmoil of the heartache of love. That love calls us to be like and yet more than our parents, and internal conflict arises when we have parents who lie, who drink, and who allow themselves to be violated by others. The other slices of life that come under the poet’s gaze never quite come close to holding the same intensity as those of childhood. The section on an affair strives for that same objective yet intensely emotional view, yet the emotion feels somewhat stifled. 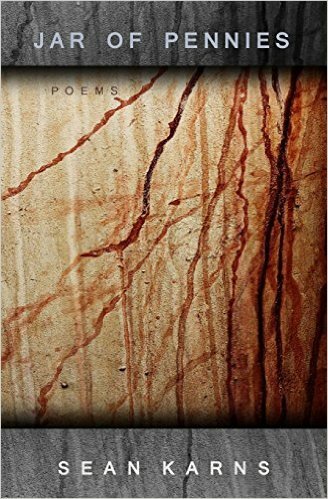 Karns is clearly trying to reach for that same space of telling only one’s story, but the silent resonances in the empty space around the words does not quite have the same powerful impact as the poems on family and childhood. Karns knows how to take “comfortable” narratives and give them their power through accurate, intimate detail. The honesty with which Karns speaks from the depth of himself possesses all the hefty weight of a jar of pennies in a toddler’s hands. Amanda Hemmingsen, a Kansas native, has been consuming and creating poetry for quite some time now. Currently serving as the Poetry Editor for Ad Astra.